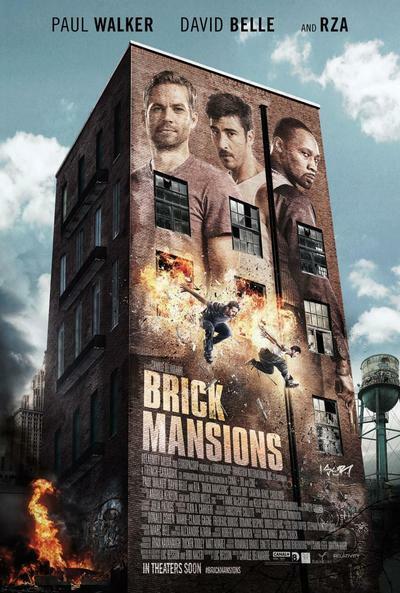 "Brick Mansions" in an English-language remake of the French action thriller "District B13," which came out in the United States in 2006. The Luc Besson production wasn’t exactly a huge hit here—it only made about $1.2 million at the box office that summer—but it was a critical smash and became a cult favorite. In retrospect, "Brick Mansions" is a great example of what Walker did best all along. Once again, he serves as the strong, stoic center in a sea of larger-than-life villains and weirdoes—a thankless job, and one that’s easy to underestimate. But clearly he recognized that was his strength: to use his California-surfer good looks, quiet calm and strong physicality to project the image of an appealing and reliable action hero. "Brick Mansions" affords him a bit more range than he’d enjoyed in his previous films—he gets to be funny, kinda, as one half of a mismatched buddy duo—but it’s also the most physically demanding movie of his career. If Walker’s demise at the height of his powers at just 40 years of age draws in more viewers to this sufficiently entertaining action flick, so be it. It’s both a celebration of his talents and a bittersweet hint of the further talents he might have revealed. Walker stars as Damien Collier, an undercover police detective in a dystopian, futuristic Detroit. (Otherwise known as: next week. I kid!) City officials have built giant walls around dilapidated housing projects known as Brick Mansions, hoping to keep the grime and crime in a single, self-contained place. Damien must team up with a longtime resident of the projects, Lino (David Belle, reprising his role from the original and making his English-language debut), to take down the drug kingpin who rules these buildings: Tremaine Alexander (Wu-Tang Clan’s RZA). Each man has a score to settle with Tremaine, who is clearly evil because he dresses expensively and spends his afternoons finely chopping vegetables with a giant cleaver for the gourmet meals he creates. (As an actor, RZA is a great rapper.) Tremaine has a minor army of heavily armed goons at the ready to protect him or take a bullet if they cross him. Later, he will reveal some seriously over-the-top firepower. At the film’s start, the heavily-accented, do-gooder Lino must escape some of Tremaine’s thugs after stealing a massive stash of his cocaine and dumping it down a bathtub. This thrilling opening sequence is pretty much a shot-for-shot remake of the first set piece of "District B13," and it allows the ripped, shirtless Bell—who co-founded the parkour movement—to show off his gravity-defying skills. He leaps over bad guys, through windows, down stairwells and across alleys. But this time, the climactic act of making a massive jump from one rooftop to another is even more difficult because Lino must flee the fiery blast from a grenade that’s been tossed his way. ‘Murrica, we like when stuff blows up. Naturally Damien and Lino clash, physically and verbally, when they first meet. Their wisecracking banter is sporadically amusing but usually cringe-inducing. (You can credit—or blame—Besson for the screenplay.) Soon, each recognizes that the other is his equal, and that they have a common enemy. As is so often the case in these kinds of movies, Damien insists that Tremaine is the "one last scumbag" he’ll go after before quitting his dangerous gig. And given the way Walker’s life ended, some of the situations his character puts himself in while trying to clean up the city are just chilling. Damien hangs from the back of a speeding car, climbs onto the roof of a police van (which he eventually crashes at 80 mph) and takes the wheel of a souped-up Mustang to avoid Tremaine’s posse. Being the auto aficionado that he was, Walker probably felt extremely comfortable shooting these scenes, but it’s uncomfortable for us as viewers to watch them now. But director Camille Delamarre, a longtime editor on Besson productions making his directing debut, doesn’t want you thinking too much or feeling too deeply. He wants to wow you to a thumping techno beat, and he achieves that for the most part in his elaborately choreographed (if overly-edited) set pieces and chases. There’s also some obligatory girl-on-girl fighting action between Lino’s kidnapped girlfriend (Catalina Denis), a saucy waitress in a barely-there uniform, and Tremaine’s sadistic henchwoman (a fierce Ayisha Issa), who likes to prowl around the projects in a black-leather bustier, fishnets and knee-high boots. You know, for comfort on those hot summer days. The action may be serious, but "Brick Mansions" doesn’t take itself too seriously. It’s a ridiculous movie that has the decency to acknowledge that it’s ridiculous.